"Prince and I had a magical journey together and I loved him immensely," she said in a statement issued to E! News. "The world knew him as a musical genius - I knew him as a husband, friend and fierce philanthropist. "Philanthropy brought us together and it was Prince who encouraged me to start my own charity over 10 years ago." "I just reached out to him a few days ago to let him know that I was building a school in his honor," she continued. "My heart aches that the school will now be built in his memory." She concluded: "His passing leaves me with such a devastating feeling of pain and loss. The love we shared, the music he made and our life together is forever engraved in my heart. I will always love and respect him. I am heartbroken beyond words." 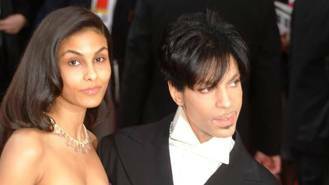 Her comments follow those of Prince's first wife, dancer Mayte Garcia, who insisted the musician had been "my everything" shortly after the news of his death at his Paisley Park home in Minnesota first surfaced on Thursday (21Apr16). Meanwhile, another former lover and ex-bandmate, drummer Sheila E, has flown to Minnesota to be with Prince's family following their shocking loss. After telling fans on Twitter "there are no words" to describe the sad news, she joined the singer's relatives, including sister Tyka Nelson, at his Paisley Park estate, where huge crowds had gathered to mourn Prince's death. Discussing why she made the trip on U.S. morning show The View on Friday (22Apr16), she said, "We're gonna try to help with the family and friends here. I thought it was important to be here; I know that he would want me to be here. It's pretty devastating, it's almost surreal. It doesn't feel like this is really happening." Sheila E added, "I lost a friend, I lost someone that I loved. I'm gonna miss him. We've done so much together, we've been together most of our lives, since 1978 - it's a long time." She then went on to thank devotees for turning out in droves to honour the superstar's legacy. "I was at Paisley last night and people were still coming, the fans, and leaving flowers and balloons and gifts, and we just wanna thank you from the bottom of our hearts for supporting him and loving him like you do," she said. "He wrote music for you. He loved the people. This is why he did what he did and worked so hard."